Ok, well, it took me a bit of time to get back on track with life (maybe I haven't exactly done that yet) but I'm here with another Friday Favorite Five which is hosted weekly by Susanne at Living to Tell the Story. #1 - The safe and healthy birth of Bookworm3 (my little girl)! She is now one month old, if you can believe it! Again, I have to ask, why does pregnancy last SO LONG and then they come out and time just totally flies by!?!? She is a joy and a delight. I absolutely LOVE having a little girl in the house. I like having little boys also, for the record. It's just fun all around, I guess. 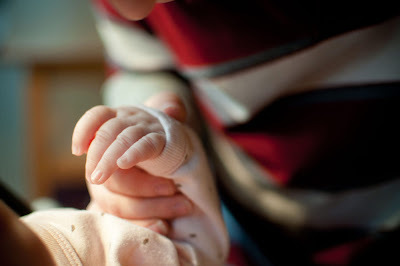 The above picture is of my oldest holding onto my youngest. Bookworm1 asked me if baby's eyes were open. I affirmed that this was the case and he came over to greet his little sister. "Helloo," he coo-ed. "Are you having a wonderful time looking at me?" Bookworm2, age two, has been equally helpful, frequently anticipating baby's needs. If she is crying he will run up and lean over her crooning, "Ohhh baby, baby, baby." Jonathan says it's like a bad Elvis impersonation. Of course, Bookworm2's solution to her every problem is to bring her a bottle post-haste. If the baby is chunky, it might not totally be my fault! #4 - Six years of marriage! I wrote this anniversary post up last week, documenting the progression of Jonathan's and my relationship through song. Thanks to a fabulous sister-in-law (and her pretty cool fiance) we had a "night out on the town" which consisted of dinner out and a walk around the local (beautiful) campus. So thankful for a lovely sunny evening (a rarity!) and the ability to walk after the c-section! (Recovery has been slow and steady.) Then, Jonathan surprised me with this upon our arrival home and we watched an episode while eating dessert. 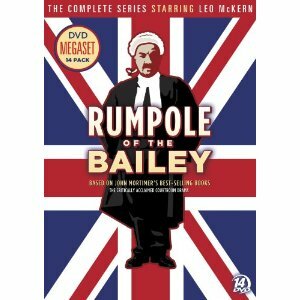 Rumpole of the Bailey is to the law what Wodehouse is to golf, you might say. I am greatly amused by him. Especially since he reminds me of an attorney that I used to (love) working for. From bloggy friends to church family to relatives we have just been blessed beyond measure after the birth of Bookworm3. Even after meals had officially ended, they are still being provided to us! I seriously have not had to cook in the ENTIRE last month! We've had plenty of food and leftovers to tide us over. My mom came out for a week after baby was born and took care of the boys (and the girl) while I was recovering. I do not even know who to thank for some of the things that we have received! It's been amazing and we're so very grateful for each individual who has rejoiced with us as we have been rejoicing. (Romans 12:15) We have had plenty of people weep with us over the past few years. It's refreshing to REJOICE! And so we do rejoice! And we thank each and every one of you who have done so alongside us - happily and willingly. That is a blessing in and of itself and we are grateful. Blessings on you all this weekend! My favorite line in this post? "Are you having a wonderful time looking at me?" That is too adorable for words! Oh, Carrie, I loved everything about this post from the sweet picture of your oldest boy holding Baby Girl's hand to his asking, "Are you enjoying looking at me?" So cute! Girl! I did not know you had a C-section! Bless your heart. I totally understand your gratefulness to finally be able to walk upright. So glad you have been well taken care of by family and friends! Thanks for sharing with us from your heart. Blessings to you! What a packed-full-of-blessings Fave Five! Love that the boys are so enamored of their sister and willing to help. And so glad for the help and support you've received. I've heard of Rumpole but not seen it -- sounds fun! Oh, I love that sweet hand! Congratulations on your beautiful baby girl!!! Oh, Carrie. What a joyful wonderful post. I'm amazed you have time to type up your fives with all the activities in your home. Thank you for sharing these lovely blessings. I hope you'll share more of these sibling conversations -- they are precious! Sounds like you are greatly loved by all who know you! Love the quote by your oldest. LOL. 4 is a great age to welcome a baby into the family. Keep on enjoying these treasures! Oh new babies are so darn sweet. Yours has an adorable hand I just love those tiny fingers. Oh what a blessing that your sweet baby girl is a month old already!! I'm glad the bookworms are dealing well with the addition of their sister to the family. We have 2 boys and then were surprised by a little girl. It's been a fun journey as they are now 32, 30 and 25!! Glad you are getting some good help. What a beautiful bouquet!! Congratulations on the birth of your little girlie bookworm! Rumpole--I've read all the books! Love that funny man! My younger nephew asked when Louise was born, "Are her eyes open yet?" My mom's cat had just had kittens. . .
Oh dear, I feel like such a bad bloggy friend! It did cross my mind to send you a card when I got your (adorable) photo, but then I forgot again. Hopefully I will actually get to meet little Bookworm 3 (and the rest of you!) this summer! It looks like mid-August is the plan! I suppose that with 3 bookworms you are more than busy, lol ! I will see my little grandson this weekend,now 6 months old ! Your stories about your boys have me giggling here, all alone in front of my computer. God bless! congrats on the arrival of a healthy baby girl and her good integration into the family. your boys are so cute with how they interact with their new sister. the time does fly by. congrats on 6 years/ may you have triple that amount in the future. sounds like you are surrounded by a wonderful, practical group of people. it must have been great to be provided foodwise for a whole month. i have been too so i can appreciate the love this conveys. So great to hear how well everything is going! What blessings you've been given, over and over. Congrats on your little girl. What a sweet blessing.. a little girl! I'm so glad her big brothers and your friends have been so helpful. The days really do fly by, and it must be nice not to have to worry about some of the little things. I love bloggy friends, too! What a sweet family you have. Your telling of their sibling interactions with the new baby made me smile and brought back lots of memories. What a blessing to have meals brought for you. 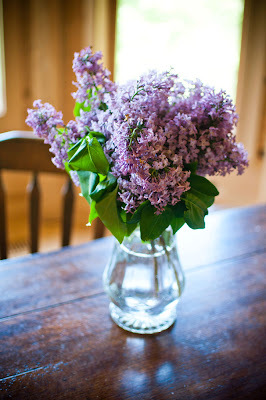 The lilacs are lovely. Congratulations on the birth of your child! Sounds like you have a lot to be thankful for, its wonderful when everyone pitches in to help at times like these. Haven't been by in a while, so just wanted to say congratulations on all fronts! I'm thrilled you have a new healthy baby in your home. What a blessing. And congrats on your anniversary, truly another blessing.